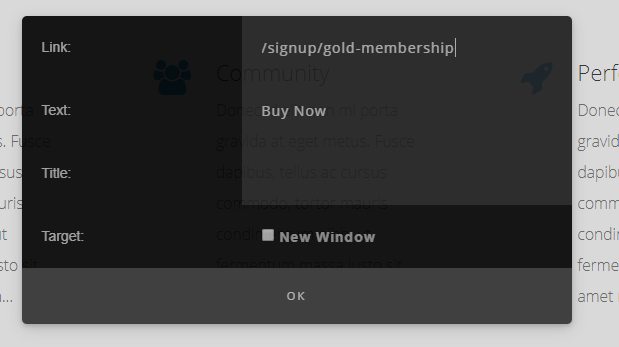 When you create Membership Plans in the system they are automatically shown on your sign up page https://yourwebsite.com/signup but you might want to use those same links on another website or on a different page on your Training Tilt website. Each membership has two of it's own pages. You can use the links from either of these pages depending on your goal. 1. The detail page: This shows all the details of your plan including description and pricing. You might want to send people to this page if they don't already have all the info they need to purchase. To get this link go to the admin page for your membership plans, find the plan in the list and click the "View Live Page" link. This will take you to the detail page for the plan. 2. The payment page: This page just shows the title of the plan and has the fields so they can enter their details and signup. You might want to send your customers to this page from another website or from a page where you have already informed them of pricing and benefits etc of the plan. To get this link follow the steps for part 1 of this doc and then click the "Sign up" button which will take you to the payment page. This will depend on which website platform you are using for your other website. Please consult the documentation of your website provider on how to create a button or link pointing to an "External Link or URL". Once you have the URL (remember just use the relative url not the full url) go to the page you want to add the button to. Edit the page using the new editor and add a template that includes a button. Hover over the button and select the "Edit Link" option and then paste in the url. Click OK then save the page.